Let someone know where you are going, the route you are taking, and when you expect to return. Plan an alternative take-out point in case of emergency. Monitor the weather. Check the forecast before leaving, and prepare for rain even if you don’t think it will. Bring a weather radio as an early warning system for inclement weather. Dress appropriately for the weather. Wear quick-drying clothing (not cotton!) made of a material that retains heat even when wet, to help you stay warm and dry. Wear bright colors or a high-visibility life jacket. The law requires a boat to carry one life jacket per person aboard, but people die each year because they weren’t wearing their life jacket. Buckle and zip up that life jacket! Learn more about life jackets. Carry a first aid kit and know how to use it. Carry a cell phone or radio for emergency communication, but keep in mind you may not have service in a river valley or remote area. Carry plenty of food and water. Drink fluids frequently to avoid dehydration, which can impair your judgment and damage your health. If you get a headache or haven’t urinated in a few hours, drink a quart of water. Get more suggestions of what to carry with our paddler’s checklist. Learn more about boat and water safety. Don’t paddle if you are under the influence of drugs or alcohol. Use extra caution when paddling in cold water. Boating accidents are five times more likely to be fatal if the water is colder than 60 degrees. 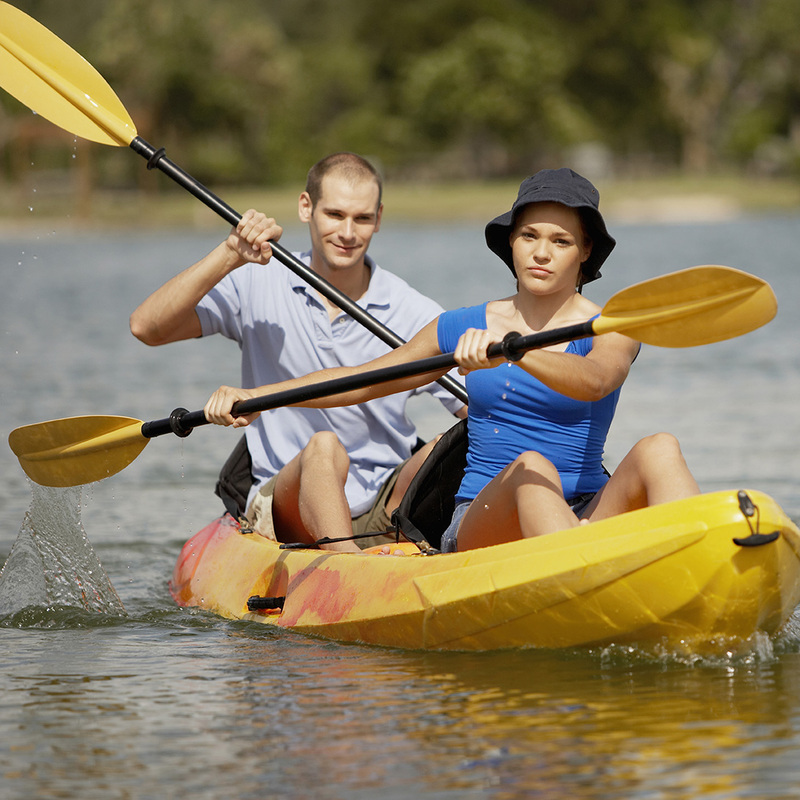 Never strap a person or lifejacket to a canoe or kayak. Paddling in a group is safer than paddling alone. If you are in a group, stay within visual or verbal contact if possible. In areas of high motorboat traffic, stay near the shore, and approach waves head-on or at a slight angle to avoid capsizing. If you do fall out or capsize, keep your feet pointed downstream and keep them off the bottom to avoid getting snagged or stuck. Stay upstream of your boat to avoid getting pinned between it and a rock or log. Scan ahead for hazards like overhanging trees, rocks, low bridges or rapids. Riffles in the water mean that rocks are dangerously close to the surface. Follow the smooth water shaped like a “V” pointing downstream.